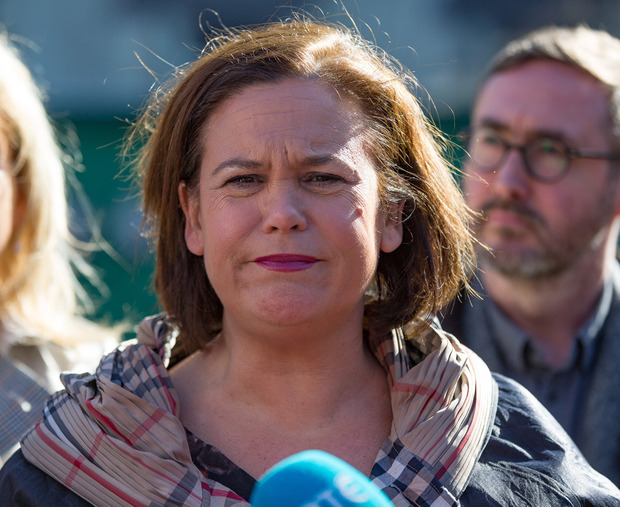 The decision by the Sinn Fein president Mary Lou McDonald to pose with a banner reading ''England get out of Ireland'' at the St Patrick's Day parade has been widely and rightly condemned as "offensive, divisive and an embarrassment". Indeed it is not only that, but also entirely stupid, as has also been pointed out, for England is not now and never has been in Ireland. For a political leader who, at the outset, suggested that reconciliation was and would be the focus of her leadership, Ms McDonald is failing abysmally to live up to that sentiment. "No explanation needed," read the caption on a photograph of Ms McDonald behind the banner issued by Sinn Fein. However, a proper explanation is required rather than the bluster which has emanated so far from that quarter. Perhaps the only explanation is that Ms McDonald is flailing badly as a supposed modern new leader and that she has returned to party source to shore up her internal support. If so, that tells as much about the continued authority behind Sinn Fein as it does about its new leader. Elsewhere last week, a convicted IRA bomber known as Witness O named four men he said were responsible for the Birmingham pub bombings, telling the inquest he had been given permission to do so by the current head of the IRA in Dublin. Twenty-one people were killed and more than 200 injured when bombs were detonated in two city centre pubs - the Mulberry Bush and the Tavern in the Town - on the evening of November 21, 1974. Giving evidence in court last Friday, the anonymous former IRA member said he had been told by the head of the IRA six months ago in Dublin that he could name those he knew were involved. This is truly an extraordinary state of affairs. For the uninitiated, the so-called IRA Bible, otherwise known as the Little Green Book, asserts that the IRA's Army Council, in 1938, formally and in writing handed over the role of the "Government of the Irish Republic", established in 1916, by a handful of opponents of the Treaty who had been members of the Second Dail up to the ratification of the Treaty in 1921. These former TDs convinced themselves that even though most of them stood in subsequent elections to Dail Eireann, the body to which they sought election was a bogus, usurper parliament without legitimacy. They conferred on themselves the status of "Executive Council" based on their membership of the Second Dail and claimed thereafter to be the legitimate Government of the Irish Republic. After 18 years' acting as the unelected Government of the Irish Republic, they decided to vest their governmental role and powers in the Army Council of the IRA in 1938, the year after the adoption of the constitution of Ireland. To this day, this is exactly what the membership and leadership of the Provisional movement believe. This further evidence that the IRA still exists, indeed that it has a head in Dublin, is deeply disquieting. Perhaps Ms McDonald might also explain this state of affairs as she should also properly explain whatever logic she may hold behind the decision to pose with, effectively, a ''Brits Out'' banner and how these events square with the tenets of the Good Friday Agreement, which declares that a united Ireland can only be achieved with the consent of a majority of the people of Northern Ireland.